There's a lot of chatter around the industry about the possibility of ABInBev purchasing SABMiller. It's been going on for a while and many think a deal is imminent. There are those who think such a deal might be a good thing for craft beer. For good reason. Today, ABI produces beer in something like 25 countries. That seems like a lot. But you have to recognize they are highly relevant in only a few...Canada, the U.S. Brazil and Mexico. These are mature markets where craft beer is an increasing problem and mainstream macrobrew is losing traction. In the U.S. alone, big brewers have lost 10 percent in volume over the past five years. 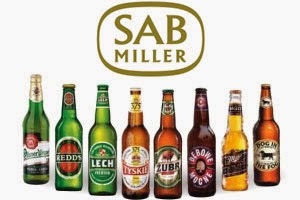 The purchase of SAB would give ABI access to a flock of emerging markets in Africa, Asia and Latin America, These are not havens of craft beer. If the SABMiller acquisition happens, ABI will almost certainly focus its attention on maximizing profits via layoffs, asset sales, supply chain consolidation, etc. After all, that's their version of brand building. That kind of scenario would be nice for craft brewers. Not that it really matters. Once you get past a few acquisitions and crafty styles (Goose Island and Shock Top come to mind), it's pretty clear ABI lacks a firm commitment to craft beer. Most of its recent efforts have focused on boosting declining Bud and Michelob brands via spin-offs like Bud Light Platinum, Black Crown and the fruity 'rita beers. Yet the volume hole continues to grow. When you look a little deeper, you realize ABI is not built to attack craft beer. I saw an interesting comment in a column written by an anonymous contributor to an industry newsletter that brought that point home. The author said essentially this: The more marketing muscle the big guys put into their craft-like brands, the more they convert mainstream consumers to craft beer. Bingo! This is likely the biggest reason ABI wants to purchase SAB and go down the familiar road of cost cutting and consolidation. That is what they know. Trying to address the growth of craft beer by growing their own crafty brands and acquiring others is largely an alien concept. Plus, going down that road risks losing even more of their mainstream, core market share. The scenario reminds me of a conversation I had a couple of years ago during a job interview. I had come from a company that experienced a sharp revenue drop largely because it knew how to sell its products only one way. The interviewer asked, "When you saw things going downhill, why didn't you shift to a different sales model?" My answer was simple. The company was incapable of making any significant adjustment because it had been built to do business a particular way. Changing course would have required changing everything and that takes a lot of time, effort and expense. It wasn't feasible on any kind of realistic timeline, even if someone had wanted to do it. And so it goes with ABI. They are built and truly good at one way of doing business. Acquiring SAB would allow them to stay in that comfort zone, lining the pockets of executives and satisfying shareholders. There are plenty of reasons why a deal for SAB won't happen, but this is one good reason it might.